My Orange Brompton: Emergency Tyre Boot! 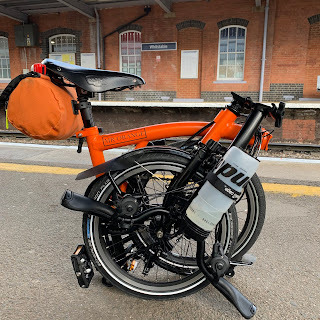 If you have read my blog entry for my recent London to Brighton ride you will no doubt have remembered David having a major problem with one of his tyres. A solution was found in a little piece of kit called a tyre boot. After this ride I made it my business to get one of these...just in case. A punture is easy to deal with. The quickest and best solution is to carry a couple of spare inner tubes and if all else fails a puncture repair kit. Damage to the sidewall of the tyre for example requires a different solution which is where the tyre boot comes into play. I opted for the Park Tool version which can be bought for £3.99. 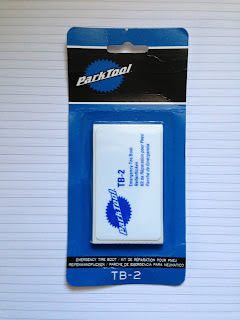 In this pack you get three 76 x 45 mm strips with an adhesive layer. You clean the area surrounding the cut or tear and then stick the patch down. It is able to withstand pressure and will hopefully get you home or to a place where you can get a new tyre. A friend said that another idea is to wrap some duct tape around your tyre levers so that this can be used to help stick the tyre boot in place in the unlikely event that the adhesive does't take. I for one will not be going anywhere without one of these as it is a very inexpensive bit of kit that could come in handy for me or one of my cycling buddies. The Kevlar tyres are virtually puncture-proof, though I accept they don't look nearly as good as yours do.